All about brownies : history, ideas, recipes, need to knows, facts etc. Where did the term “brownie points” come from? Brownie Points – the Dello Mano Way! 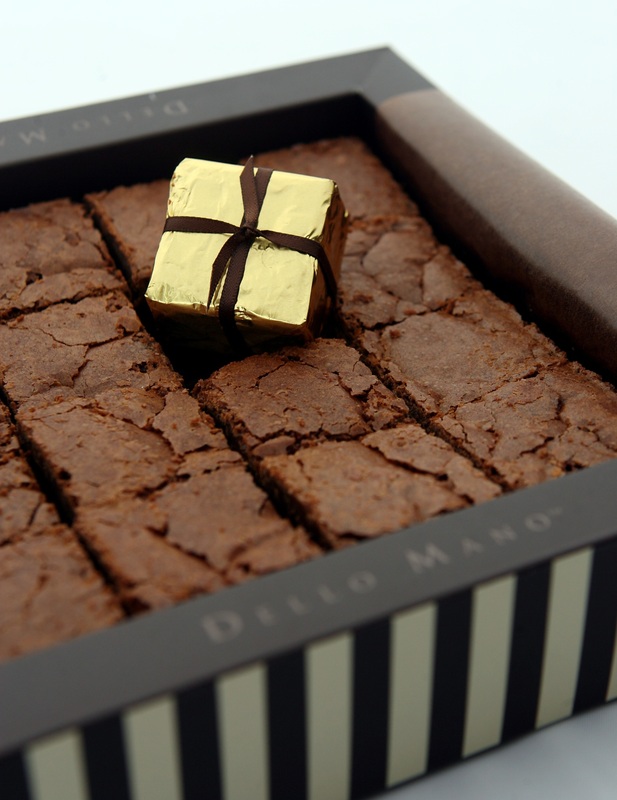 Here at Dello Mano we’d like to think that everyone is striving for “brownie points” – we certainly are! A client came into our store the other day and asked abut the term and it got us thinking. 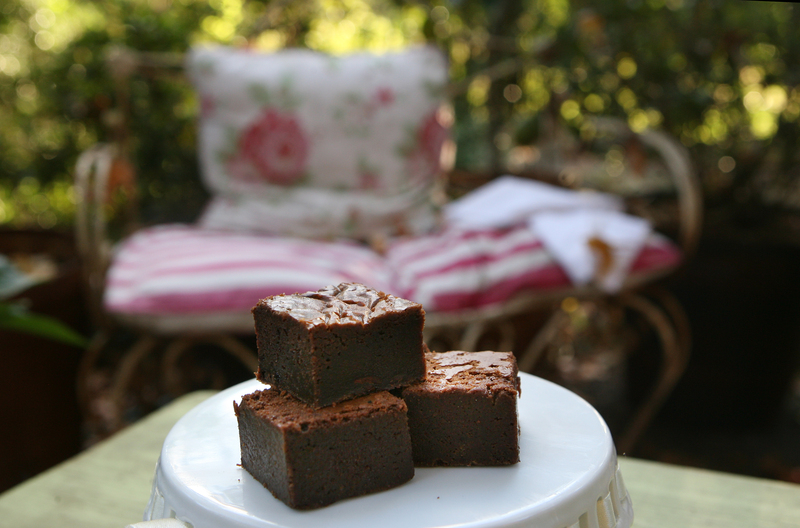 For most of us, the term brownie refers to delicious squares of chocolate heaven but when followed by ‘points’, it implies something totally different. We use the term as an idiom for someone trying to earn favor or approval, “If I do this I might earn a few brownie points”. So what does a chocolate have to do with earning approval? The phrase brownie points could have originated from a number of sources. In the Australia,US, and the UK it is most commonly associated with girl scouts who are also called Brownies. Girl scouts get badges for a variety of milestones and it is commonly assumed that these badges became the source of the term. However, there are other stronger influences that probably made the phrase popular. A gentleman called George R Brown developed a scoring methodology for railroad workers in the late 19th century that became very popular and soon people were referring to their scores as ‘Brownie Points’. Another suggestion is that the term came from the use of brown stamps post World War 2 to encourage customers to shop at grocery stores. The grocers would present customers with brown stamps, which could be exchanged for a gift later on. Finally a publishing house is credited with incentivising its delivery network of youths with brown vouchers for achieving their sales target. These too became known as brownie points. Any thoughts or ideas about the term Brownie Points? Which do you think seems like the most plausible definition? Yes it is true we are absolutely passionate about brownies but for many of you who have visited our Dello Mano store at 29 Doggett St. Teneriffe you’ll know that we too love art. 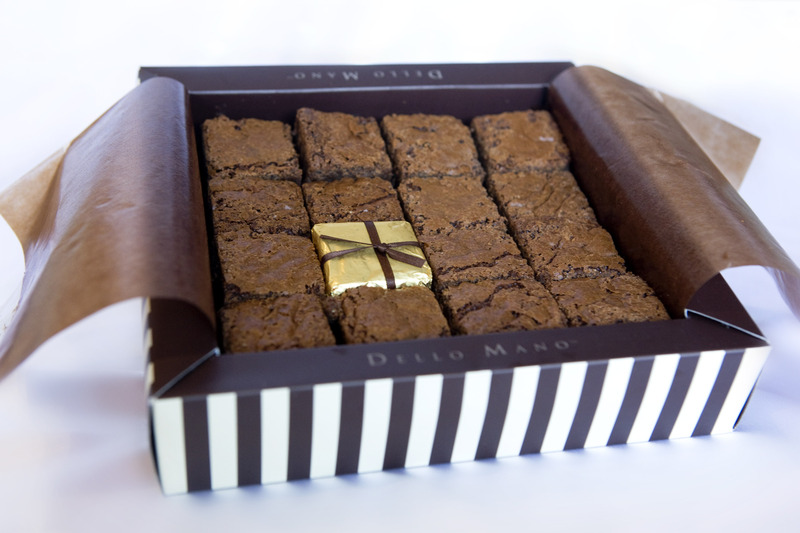 The words Dello Mano are corrupted Italian for “of the hand” meaning that we hand make our brownies, chocolates and cookies. As we were fitting out our new Doggett St. store we felt really strongly that our own hands then should be put to work in creating the atmosphere that would be our first Dello Mano store. 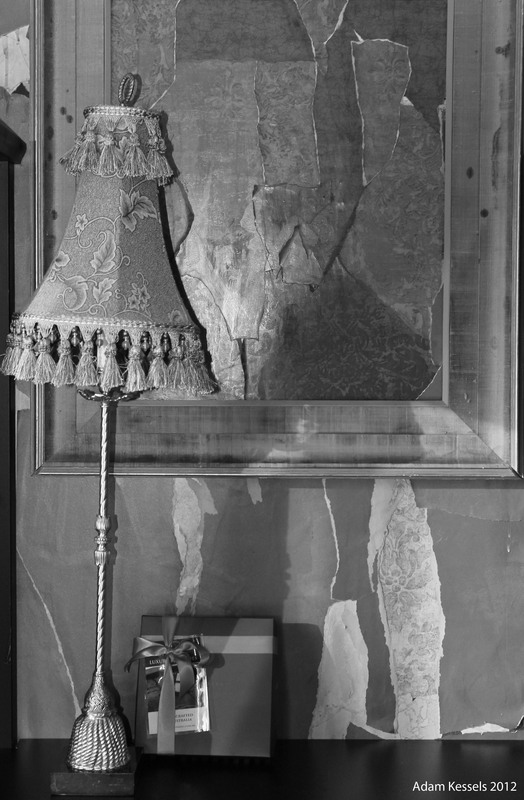 We started the decoration process with the library wall (to be honest the rest of the store was still being built but we were on a tight schedule ) where I had been determined to use wallpaper. With less than a couple of weeks to opening day, I scurried down to the local wallpaper store to select, only to find out that the lead time for many of them was about 3 weeks! With only days till opening and starring at very blank walls, I decided to get creative. I painted wall paper and then spent hours matching and assessing the colours and patterns. Nervously I eventually ripped the paper into pieces to create a collage of colour and interest. As I put the wall together there was much comment from many on site 😦 however in the end I felt that we had created something of our own uniqueness,with our own hands and therefore put a little piece of us (albeit an exhausted us ) into the foundations of the store itself. Over this last weekend, Adam and Margaret two of our very supportive Dello Mano friends visited the store. Adam is a keen photographer and took this lovely photo of the library collage wall to which I am referring above. Great work Adam and thank you for sharing it so generously with us. 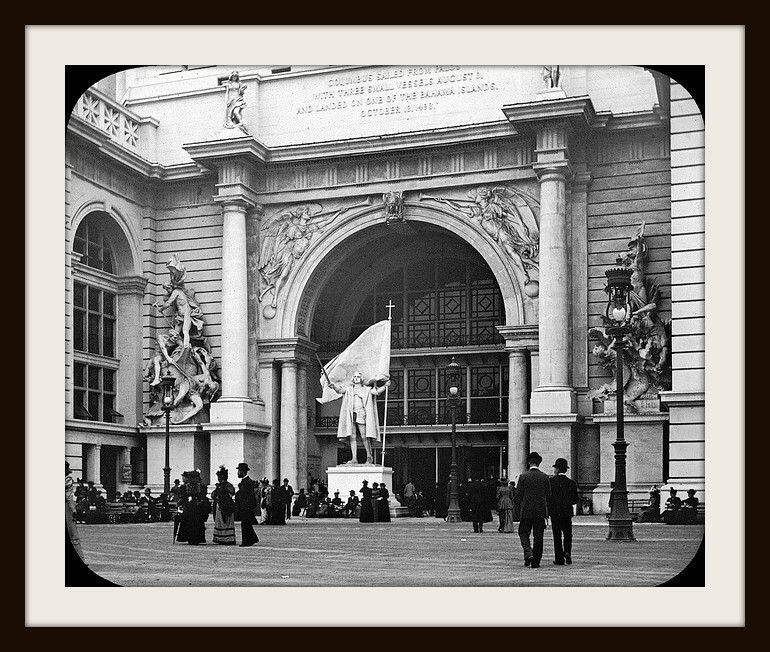 The Columbian Exposition, in Chicago, was the last and apparently the most grand of the World Fairs. Millions of people visited from all over the world and it was a time of great excitement providing the chance for manufacturers to showcase different products. 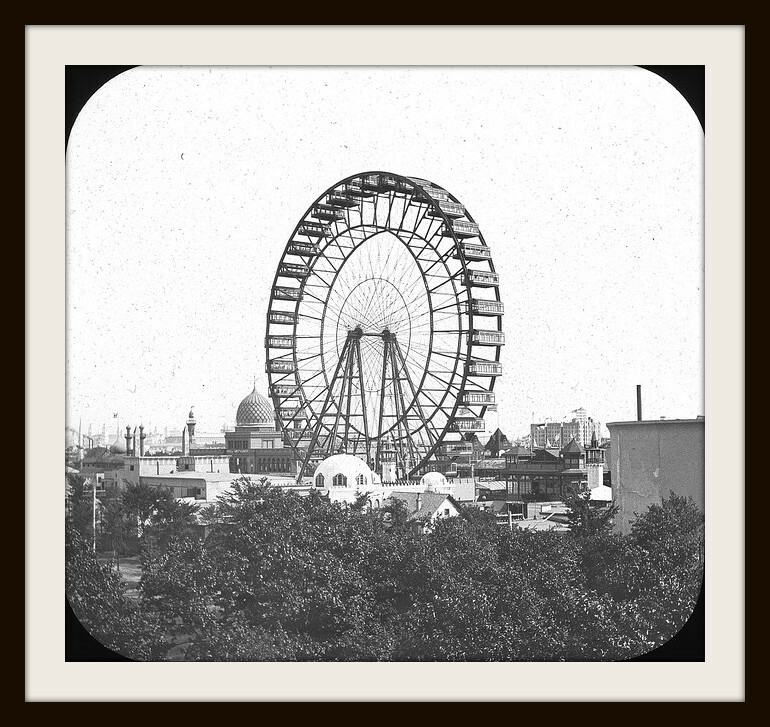 As with all the great fairs, many engineering feats were on display including the giant Ferris wheel providing a great view of nineteenth century Chicago. The fair also offered a showcase for fresh produce. 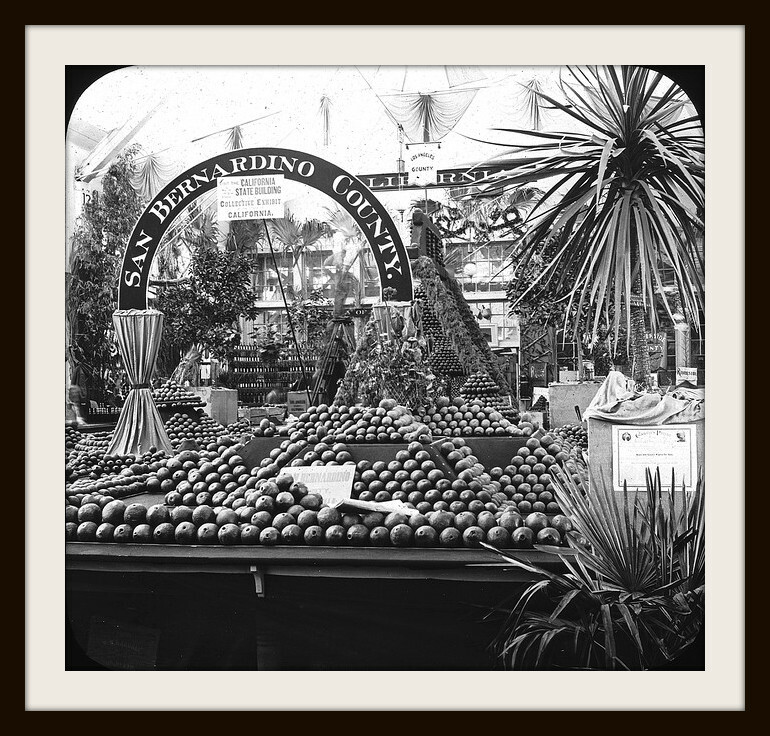 Great fruit and vegetable displays demonstrated the care and pride of the agriculturists. These displays perhaps the origins of the showcases we still enjoy at many of the Agricultural Shows that exist today. I know we always make a bee line to the fruit and vegetable displays at the Ekka here in Brisbane. They’re always such a beautiful reminder of the great produce that we enjoy here in Australia and of the amazing patience and care required by people including kids to put together such creative displays. Such was this grand and very exciting occasion that Bertha Palmer owner of the very prestigious Chicago hotel, the Palmer House Hotel asked her chef to bake a dessert that would be smaller than a slice of cake, so it could be boxed along with a lunch bag and served at the Women’s building at the Fair (Now that’s what we call style – lunch with a brownie! – is there any other way?). The chef immediately went to work, developing what is thought to be the world’s first brownie recipe. He baked the very first batch of brownies with walnuts and an apricot glaze. Apparently if you visit the Palmer House Hotel to this day you can still order this original brownie recipe. As brownie connoisseurs and with the quest to make the best brownie, a trip to Chicago is on the Dello Mano family’s “must do” list! 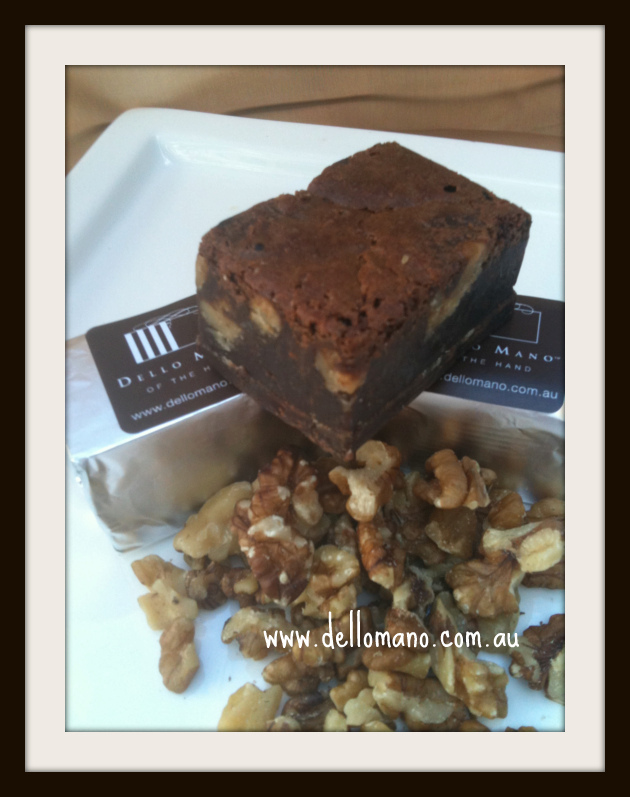 Dello Mano delicious hand made Belgian Chocolate Brownies! We’re often asked why or how we came to set up Dello Mano. This is our little Dello Mano story. Of course, for those of you who know us there is also a bigger story but lets just go with the short version. but just goes to show that a heart dream never really does go away! When Bien and I met we shared a similar dream of creating a food brand with the pure vision of providing a truly beautiful, quality, premium food and chocolate experience. We were both food marketers and just had a dream to do it our way. Our belief was and is, that this vision is only possible when food is handcrafted and prepared by people genuine in their intent, happy and creatively free. authenticity and of course the magic to each brownie and chocolate piece! Brownies and chocolate and extends to our gorgeous packaging, our attention to detail and our personalized friendly and supportive service. Each of our creations is the result of many hours of work and designed with our total vision in mind. We are about premium quality, magical handcrafted products using ingredients from people that really care. passion for our brownies, chocolate and our business. Dello Mano is fortunate in that it is the recipient of passion extending from our children, our parents, our sister Linda, Terry our brother in law and our niece Meggy, as well as several other gorgeous family friends who have all contributed because, they too believe in the dream. large follow the dream that lies within. Our own experience is that this is pure liberation! Here’s to great brownie and chocolate times!